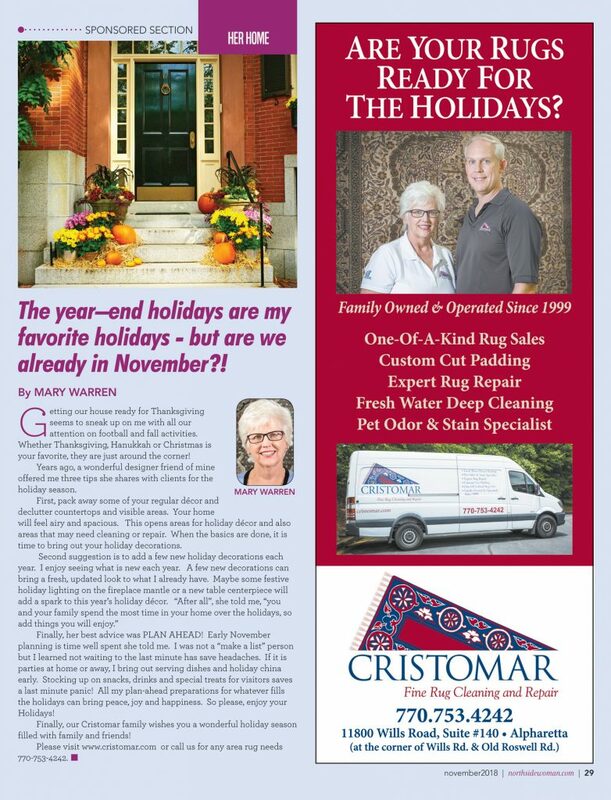 This is a sponsored news article, from “NSW” (Northside Woman Magazine), published (November, 2018) by Appen Media Group, Alpharetta, GA; with an article on “The year-end holidays are my favorite holidays – “. “Getting our house ready for Thanksgiving seems to sneak up on me with all our attention on football and fall activities. Whether Thanksgiving, Hanukkah or Christmas is your favorite, they are just around the corner! Years ago, a wonderful designer friend of mine offered me three tips she shares with clients for the holiday season. First, pack away some of your regular décor and declutter countertops and visible areas. Your home will feel airy and spacious. This opens areas for holiday décor and also areas that may need cleaning or repair. When the basics are done, it is time to bring out your holiday decorations. Finally, her best advice was PLAN AHEAD! Early November planning is time well spent she told me. I was not a “make a list” person but I learned not waiting to the last minute has save headaches. If it is parties at home or away, I bring out serving dishes and holiday china early. Stocking up on snacks, drinks and special treats for visitors saves a last minute panic! All my plan-ahead preparations for whatever fills the holidays can bring peace, joy and happiness. So please, enjoy your Holidays! Finally, our Cristomar family wishes you a wonderful holiday season filled with family and friends!